Costumes and Candies and Goop, OH MY! Yes, yes folks! It's that time of year - HALLOWEEN SEASON! Too often kiddos with special needs/special healthcare needs are left out of the fun, and well, there's just no reason for that -- especially in this day and age. So we've decided to do you a solid and create this handy dandy guide, so that YOU can do your best to have a truly inclusive Halloween this year! As you go through the guide, you will notice that certain things light up "blue". Go ahead and click on them! They're either printable PDF's (found in the Teal Pumpkin Project area), or links to a corresponding web page. We did our best to think of as many ways to be inclusive as possible, but if we left anything out, or you have some great ideas/suggestions, drop us a comment! We'd love to hear from you! P.S. 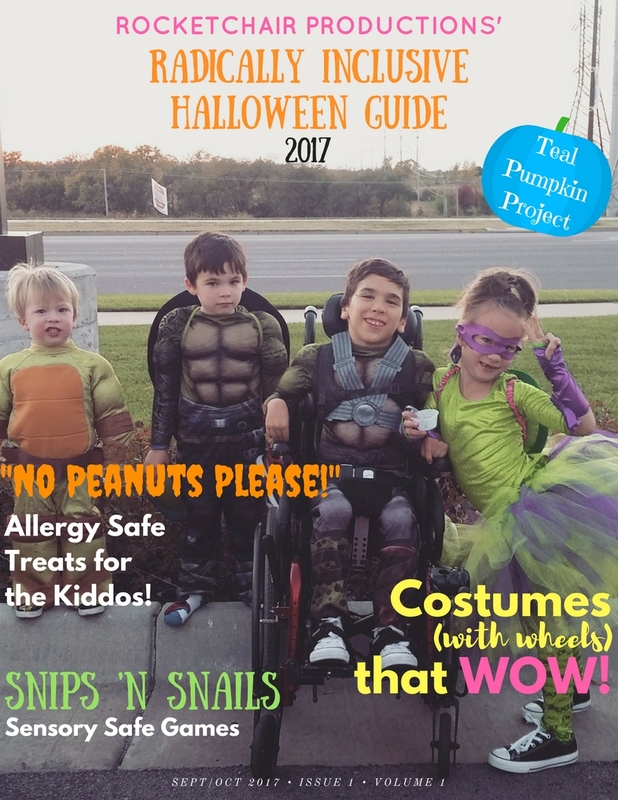 Super huge thanks to the Rinn family for being those adorable kiddos on the cover! P.P.S. For the best reading experience, view our guide in FULL SCREEN. I remember when I was 13, a friend asked me what I was going to do when I grew up. I looked him square in the eye and said: "change the world, or die trying". I had no idea how I was going to do it, but I knew that whatever I did would be in that vain. Fast forward 26 years and it's not me that will change the world, but kids. Lucky me though, I get to show them how! So I'm starting this new series on the RocketChair blog called KIDS CAN CHANGE THE WORLD (or KCCtW for short). Once a month we will post activities for you to do with the littles in your life that can lead to a more inclusive world. Some of these activities will come straight from our tried and true experiences, and some will come from moms and dads, sharing with us what they've witnessed in their homes with their littles. We're not so much interested in where the activities come from, so much as they help us change the world. Without further ado, our first activity is one of our favorite things to do - ROLLER SKATING! So, those hairy legs are not mine - they belong to my hubby. But that kid in the middle, the one in the wheelchair, she's all mine. And the two cutie pies on either side of her are her bff's. This picture was taken at my daughter's 7th birthday party. It was our first time going rollerskating, and we weren't sure how we were going to make it work, but we were going to try. What you see is my husband pushing her wheelchair from behind, and her pals holding onto her chair, skating alongside her. What we didn't get pictures of was the conga line of kids that formed behind my hubby shortly after this pic was taken, and her friends holding onto/pushing her walker as they all skated along. It never once occurred to them that my kiddo would not be able to skate with them - they just figured out how to make it work. And that's a big part of what inclusion is - figuring out a way to make something work for EVERYONE. This is just one example of how our kids can change the world. We will be sharing more examples once a month, but we want to hear from you too! Have a story of inclusion to share with us? Were your kids included, or did your kid figure out how to include a differently abled pal? Tell us about it! Leave a note in the comments - let's celebrate those little world changers of ours!